Hundreds of federal political ads — including those from major players such as the Democratic National Committee and the Donald Trump 2020 campaign — are running on Facebook without adequate disclaimer language, likely violating Federal Election Commission rules, a review by ProPublica has found. An FEC opinion in December clarified that the requirement for political ads to say who paid for and approved them, which has long applied to print and broadcast outlets, extends to ads on Facebook. So we checked more than 300 ads that had run on the world’s largest social network since the opinion, and that election-law experts told us met the criteria for a disclaimer. Fewer than 40 had disclosures that appeared to satisfy FEC rules. “I’m totally shocked,” said David Keating, president of the nonprofit Institute for Free Speech in Alexandria, Virginia, which usually opposes restrictions on political advertising. “There’s no excuse,” he said, looking through our database of ads. The FEC can investigate possible violations of the law and fine people up to thousands of dollars for breaking it — fines double if the violation was “knowing and willful,” according to the regulations. Under the law, it’s up to advertisers, not Facebook, to ensure they have the right disclaimers. The FEC has not imposed penalties on any Facebook advertiser for failing to disclose. 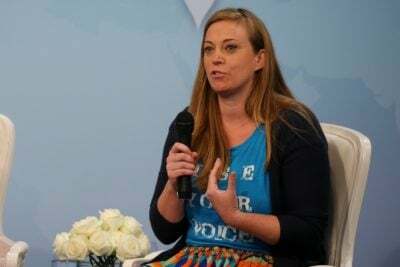 An FEC spokeswoman declined to say whether the commission has any recent complaints about lack of disclosure on Facebook ads. Enforcement matters are confidential until they are resolved, she said. None of the individuals or groups we contacted whose ads appeared to have inadequate disclaimers, including the Democratic National Committee and the Trump campaign, responded to requests for comment. Facebook declined to comment on ProPublica’s findings or the December opinion. In public documents, the company has urged the FEC to be “flexible” in what it allows online, and to develop a policy for all digital advertising rather than focusing on Facebook. Insufficient disclaimers can be minor technicalities, not necessarily evidence of intent to deceive. 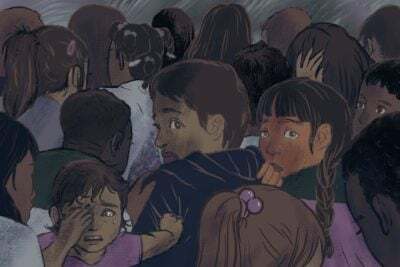 But the pervasiveness of the lapses ProPublica found suggests a larger problem that may raise concerns about the upcoming midterm elections — that political advertising on the world’s largest social network isn’t playing by rules intended to protect the public. Unease about political ads on Facebook and other social networking sites has intensified since internet companies acknowledged that organizations associated with the Russian government bought ads to influence U.S. voters during the 2016 election. Foreign contributions to campaigns for U.S. federal office are illegal. Online, advertisers can target ads to relatively small groups of people. Once the marketing campaign is over, the ads disappear. This makes it difficult for the public to scrutinize them. The FEC opinion is part of a push toward more transparency in online political advertising that has come in response to these concerns. In addition to handing down the opinion in a specific case, the FEC is preparing new rules to address ads on social media more broadly. 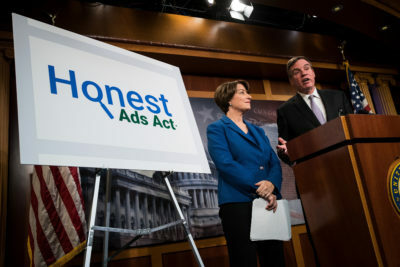 Three senators are sponsoring a bill called the Honest Ads Act, which would require internet companies to provide more information on who is buying political ads. And earlier this month, the election authority in Seattle said Facebook was violating a city law on election-ad disclosures, marking a milestone in municipal attempts to enforce such transparency. Facebook itself has promised more transparency about political ads in the coming months, including “paid for by” disclosures. Since late October it has been conducting tests in Canada that publish ads on an advertiser’s Facebook page, where people can see them even without being part of the advertiser’s target audience. Those ads are only up while the ad campaign is running, but Facebook says it will create a searchable archive for federal election advertising in the U.S. starting this summer. ProPublica found the ads using a tool called the Political Ad Collector, which allows Facebook users to automatically send us the political ads that were displayed on their news feeds. Because they reflect what users of the tool are seeing, the ads in our database aren’t a representative sample. The disclaimers required by the FEC are familiar to anyone who has seen a print or television political ad — think of a candidate saying, “I’m ____, and I approved this message,” at the end of a TV commercial, or a “paid for by” box at the bottom of a newspaper advertisement. They’re intended to make sure the public knows who is paying to support a candidate, and to prevent people from falsely claiming to speak on a candidate’s behalf. The system does have limitations, reflecting concerns that overuse of disclaimers could inhibit free speech. For starters, the rules apply only to certain types of political ads. Political committees and candidates have to include disclaimers, as do people seeking donations or conducting “express advocacy.” To count as express advocacy, an ad typically must mention a candidate and use certain words clearly campaigning for or against a candidate — such as “vote for,” “reject” or “re-elect.” And the regulations only apply to federal elections, not state and local ones. You can download the Facebook Political Ad Collector from the Chrome Web Store or the Mozilla Add-ons Store. The rules also don’t address so-called “issue” ads that advocate a policy stance. These ads may include a candidate’s name without a disclaimer, as long as they aren’t funded by a political committee or candidate and don’t use express-advocacy language. Many of the political ads purchased by Russian groups in 2016 attempted to influence public opinion without mentioning candidates at all — and would not require disclosure even today. Enforcement of the law often relies on political opponents or a member of the public complaining to the FEC. If only supporters see an ad, as might be the case online, a complaint may never come. The disclaimer law was last amended in 2002, but online advertising has changed so rapidly that several experts said the FEC has had trouble keeping up. In 2002, the commission found that paid text message ads were exempt from disclosure under the “small-items exception” originally intended for buttons, pins and the like. What counts as small depends on the situation and is up to the FEC. In 2010, the FEC considered ads on Google that had no graphics or photos and were limited to 95 characters of text. Google proposed that disclaimers not be part of the ads themselves but be included on the web pages that users would go to after clicking on the ads; the FEC agreed. In 2011, Facebook asked the FEC to allow political ads on the social network to run without disclosures. At the time, Facebook limited all ads on its platform to small, “thumbnail” photos and brief text of only 100 or 160 characters, depending on the type of ad. In that case, the six-person FEC couldn’t muster the four votes needed to issue an opinion, with three commissioners saying only limited disclosure was required and three saying the ads needed no disclosure at all, because it would be “impracticable” for political ads on Facebook to contain more text than other ads. 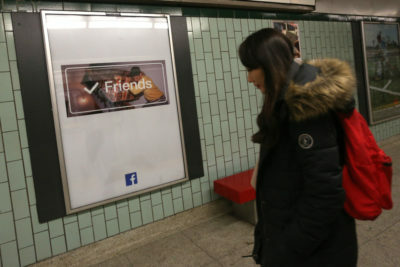 The result was that political ads on Facebook ran without the disclaimers seen on other types of election advertising. Since then, though, ads on Facebook have expanded. They can now include much more text, as well as graphics or photos that take up a large part of the news feed’s width. Video ads can run for many minutes, giving advertisers plenty of time to show the disclaimer as text or play it in a voiceover. Last October, a group called Take Back Action Fund decided to test whether these Facebook ads should still be exempt from the rules. “For years now, people have said, ‘Oh, don’t worry about the rules, because the FEC doesn’t enforce anything on Facebook,’” said John Pudner, president of Take Back Action Fund, which advocates for campaign finance reform. Many political consultants “didn’t think you ever needed a disclaimer on a Facebook ad,” said Pudner, a longtime campaign consultant to conservative candidates. Take Back Action Fund came up with a plan: Ask the FEC whether it should include disclosures on ads that the group thought clearly needed them. In a comment filed with the FEC in the matter, the Internet Association trade group, of which Facebook is a member, asked the commission to follow the precedent of the 2010 Google case and allow a “one-click” disclosure that didn’t need to be on the ad itself but could be on the web page the ad led to. The FEC didn’t follow that recommendation. It said unanimously that the ads needed full disclaimers. 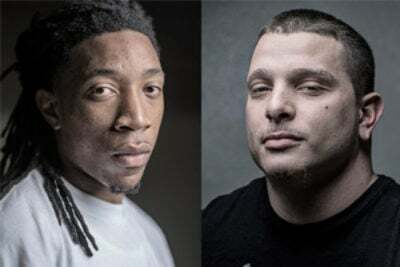 The opinion, handed down Dec. 15, was narrow, saying that if any of the “facts or assumptions” presented in another case were different in a “material” way, the opinion could not be relied upon. But several legal experts who spoke with ProPublica said the opinion means anyone who would have to include disclaimers in traditional advertising should now do so on large Facebook image ads or video ads — including candidates, political committees and anyone using express advocacy. “The functionality and capabilities of today’s Facebook Video and Image ads can accommodate the information without the same constrictions imposed by the character-limited ads that Facebook presented to the Commission in 2011,” three commissioners wrote in a concurring statement. A fourth commissioner went further, saying the commission’s earlier decision in the text messaging case should now be completely superseded. The remaining two commissioners didn’t comment beyond the published opinion. “We are overjoyed at the decision and hope it will have the effect of stopping anonymous attacks,” said Pudner, of Take Back Action Fund. “We think that this is a matter of the voter’s right to know.” He added that the group doesn’t intend to purchase the ads. This year, the FEC plans to tackle concerns about digital political advertising more generally. Facebook favors such an industry-wide approach, partly for competitive reasons, according to a comment it submitted to the commission. “Facebook strongly supports the Commission providing further guidance to committees and other advertisers regarding their disclaimer obligations when running election-related Internet communications on any digital platform,” Facebook General Counsel Colin Stretch wrote to the FEC. Facebook was concerned that its own transparency efforts “will apply only to advertising on Facebook’s platform, which could have the unintended consequence of pushing purchasers who wish to avoid disclosure to use other, less transparent platforms,” Stretch wrote. To test whether political advertisers were following the FEC guidelines, we searched for large U.S. political ads that our tool gathered between Dec. 20 — five days after the opinion — and Feb. 1. We excluded the small ads that run on the right column of Facebook’s website. To find ads that were most likely to fall under the purview of the FEC regulations, we searched for terms like “committee,” “donate” and “chip in.” We also searched for ads that used express advocacy language such as, “for Congress,” “vote against,” “elect” or “defeat.” We left out ads with state and local terms such as “governor” or “mayor,” as well as ads from groups such as the White House Historical Association or National Audubon Society that were obviously not election-oriented. Then we examined the ads, including the text and photos or graphics. Of nearly 70 entities that ran ads with a large photo or graphic in addition to text, only two used all of the required disclaimer language. 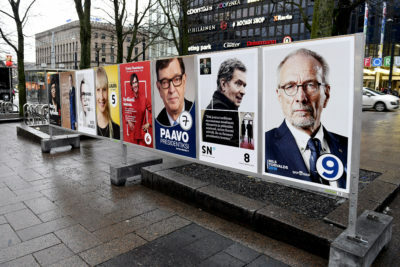 About 20 correctly indicated in some fashion the name of the committee associated with the ad but omitted other language, such as whether the ad was endorsed by a candidate. The rest had more significant shortcomings. 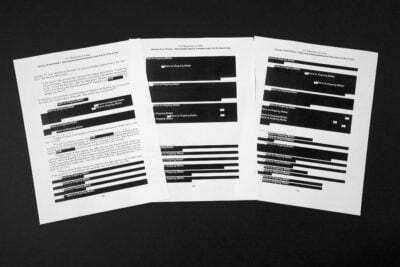 Many of those that didn’t include disclosures were for relatively inexperienced candidates for Congress, but plenty of seasoned lawmakers and major groups failed to use the proper language as well. 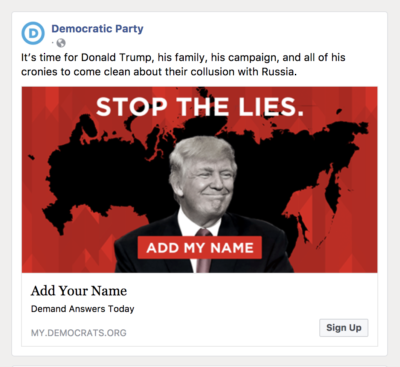 At the top, the ad identified the Democratic Party as the sponsor, and linked to the party’s Facebook page. But, under FEC rules, it should have named the funder, the Democratic National Committee, and given the committee’s address or website. It should also have said whether the ad was endorsed by any candidate. It didn’t. The only nod to the national committee was a link to my.democrats.org, which is paid for by the DNC, at the bottom of the ad. As on all Facebook ads, the word “Sponsored” was included at the top. Advertisers seemed more likely to put the proper disclaimers on video ads, especially when those ads appeared to have been created for television, where disclaimers have been mandatory for years. Videos that didn’t look made for TV were less likely to include a disclaimer. One ad that said it was from Donald J. Trump consisted of 20 seconds of video with an American flag background and stirring music. The words “Donate Now! And Enter for a Chance To Win Dinner With Trump!” materialized on the screen with dramatic thuds and crashes. The ad linked to Trump’s Facebook page, and a “Donate” button at the bottom of the ad linked to a website that identified the president’s re-election committee, Donald J. Trump for President, Inc., as its funder. It wasn’t clear on the ad whether Trump himself or his committee paid for it, which should have been specified under FEC rules. The large majority of advertisements we collected — both those that used disclosures and those that didn’t — were for liberal groups and politicians, possibly reflecting the allegiances of the ProPublica readers who installed our ad-collection tool. There were only four Republican advertisers among the ads we analyzed. It’s not clear why advertisers aren’t following the FEC regulations. Keating, of the Institute for Free Speech, suggested that advertisers might think the word “Sponsored” and a link to their Facebook page are enough and that reasonable people would know they had paid for the ad. Others said social media marketers may simply be slow in adjusting to the FEC opinion. “It’s entirely possible that because disclaimers haven’t been included for years now, candidates and committees just aren’t used to putting them on there,” said Brendan Fischer, director of the Federal and FEC Reform Program at the Campaign Legal Center, the group that provided legal services to Take Back Action Fund. “But they should be on notice,” he added. There were only two advertisers we saw that included the full, clear disclosures required by the FEC on their large image ads. One was Amy Klobuchar, a Democratic senator from Minnesota who is a co-sponsor of the Honest Ads Act. The other was John Moser, an IT security professional and Democratic primary candidate in Maryland’s 7th Congressional District who received $190 in contributions last year, according to his FEC filings. Jennifer Valentino-DeVries is a reporter covering technology and public policy.